A museum dedicated to artworks created by coal miners has opened its doors. The Mining Art Gallery in Bishop Auckland, County Durham, has 420 pieces including works by Norman Cornish, Tom McGuinness and Bob Olley. It part of a project aimed at creating a "a world-class visitor destination" in the market town. 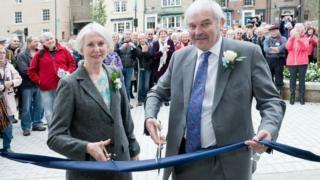 A colliery band played at Saturday's opening ceremony as the ribbon was cut by Dr Robert McManners and Gillian Wales, who donated hundreds of works. Dr McManners said: "Coal mining wasn't just a job, it was a way of life and in this gallery are the underground scenes the miners wanted to articulate alongside the community life, the long term-friendships and pride. "Heritage doesn't have to be something which is fossilised in the past, it's something we can take to the future and tell people about in this new gallery." Jonathan Ruffer, Chairman of The Auckland Project, said: "This is a very exciting day for Bishop Auckland and for The Auckland Project. "To understand why this area is so special we need to look back into its past and the miners were a significant part of that."